The folding chair and bag are lightweight. We’re often carting a cooler, picnic basket, chairs, and an overly excited dog from a parking area which always seems like a million miles from where we want to be. Oddly the more money you spend on a quality lightweight camping chair the cheaper and more flimsy the nylon chair bag that comes with it..
After barely two years of service, the seams of the bags are barely holding together. The nylon fabric is so shredded I can’t repair it. The chairs are in great shape but the carrying cases are not. I want a sturdy replacement camp chair bag.When I can’t buy, I DIY! I made one myself. It is helpful if you have an old quad chair tote bag to use as a pattern and/or cannibalize for the carrying strap and drawstring tie and stop. If not, don’t worry about it. 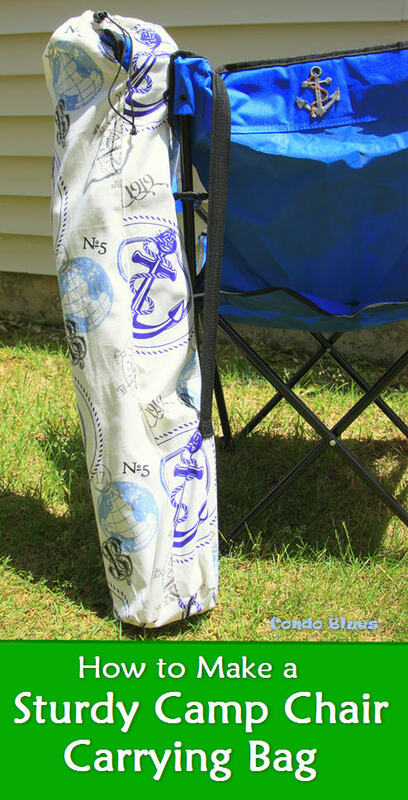 This tutorial will make 2 replacement camp chair carrying bags. 2 Yards of heavy fabric – I used washable outdoor upholstery fabric you can find online here for much cheaper than a traditional fabric store! Disclosure – This post contains some affiliate links for your convenience. I took a chair bag apart at the seams with a seam ripper. Originally I planned to use the old bag pieces as a sewing pattern until I saw the reason why the camp chair tote bags ripped and the chair barely fit inside. The nylon for the bag wasn’t cut as a perfect rectangle and the seams are so off they must have been sewn in the dark. Well that explains why the chair bags seems small in some areas and not other and why it pulled and shredded the seams in those areas. No wonder it was so hard to put the chairs back in the bags. 1. Use the fabric measuring tape to measure the length and the folded circumference of the folding camping chair. My chair is 31 inches long. The folded circumference is 24 inches. 2. Use the fabric scissors to cut a rectangle 38 and 1/2 inches long and 12 and 1/2 inches wide because I want my chair carrying bag to be larger than the storage bag that originally came with my chair. If the worn out carrying case that came with your camp chair is made from a piece of nylon that is an actual rectangle (unlike mine) it is much easier to carefully take the old bag apart with a seam ripper and use the old bag parts as a sewing pattern. 3. Cut two 6 inch circles from the fabric. This will be the reinforced bottom of chair carrying bag. Tip: I used a 6 inch tea cup saucer as a pattern for the bottom of my quad chair bag because I cannot draw a perfect circle freehand to save my life! 4. Optional: I didn’t want the raw edges of my cotton fabric to fray use with use. The first thing I did was sew along the edges of my fabric with an over lock (also called a serger) stitch on my sewing machine. You can use a zig zag stitch if your machine doesn’t have an overclock stitch on your sewing machie, or if you are lucky, you can use a serger machine. Also, it was an excuse to go to town and sew with one of those crazy stitches we all have and rarely use on my sewing machine. Mostly that. Wheeeeeee! 5. 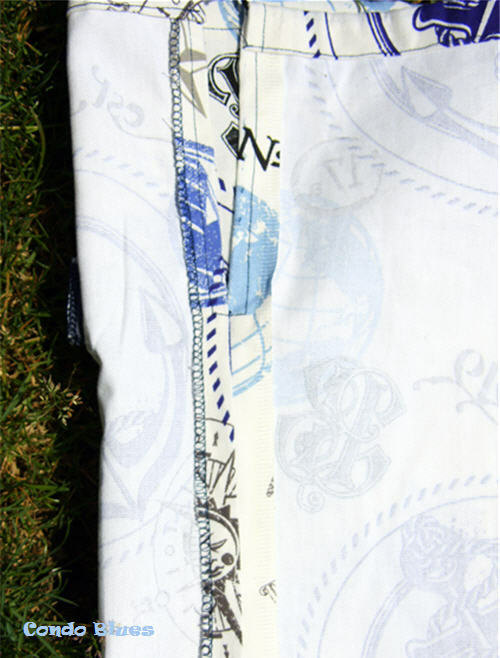 Fold the fabric in half lengthwise and pin it closed 30 inches from the bottom of the rectangle. 6. Use a straight stitch to sew it into place. Tip: remove the pins as you sew to make sure you don’t sew over a pin and break your needle! 7. 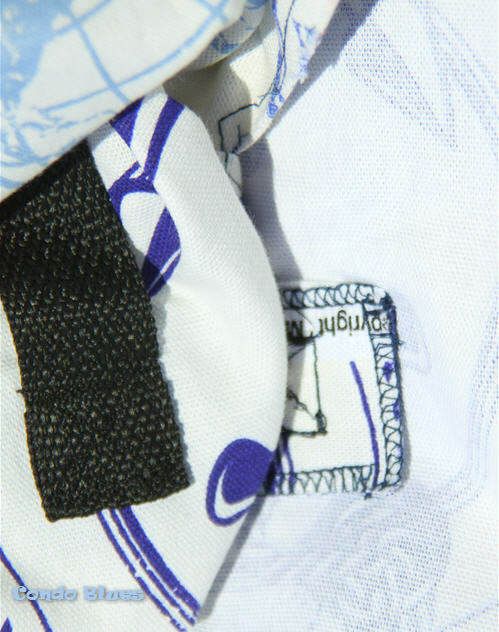 Press the seam open with iron and ironing board. 8. Turn the top 30 inches of the each side of the seam over on itself, pin it, and use a straight stitch to sew it into place. This is what Steps 8 though 10 will look like when you are done. Step 8 is sewing the seam down to make the V shape at the opening of your bag. This will make it easier to put the folded chair in and get it out of the storage case. Normally I would finish this type of seam by folding and sewing the fabric over on itself but I am taking advantage of keeping the selvage edge (the non fraying edge used to weave the fabric in the factory) and serger stitching the raw edge. 9. Use a sewing gage to measure and fold the top edge of the bag over by inch, press the fold into place with an iron and ironing board. Then fold the folded fabric over by one inch and pin it into place to make the draw string casing. 10. Use a straight stitch to sew the draw string casing into place. 11. Cut two 1 and 1/2 inch by 2 and 1/2 inch rectangle from heavy interfacing and cotton fabric. 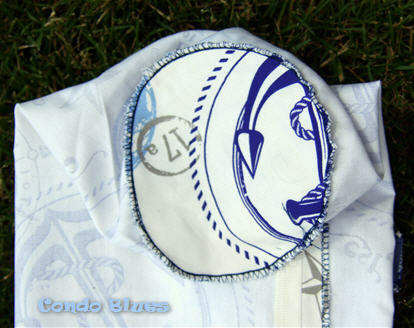 Sew the layers together around the edges if desired. These rectangles will add stability. These stabilizers will add an extra layer of stability to the areas where the carrying strap and the bag meet. 12. Cut a 24 inch piece of webbing with the scissors to make the carrying strap. 13. Fold each end of the webbing over on itself by one inch. 14. Turn the tube right side out and pin the top of the folded webbing 5 and 1/2 inches from the top of the carrying bag and 3 inches from the side seam of the carrying bag on the right side (the pretty side of the fabric) and with the rectangle stabilizer you made in Step 11 inside the bag. This is what Steps 11 through 14 will look like from the inside and the outside of the carrying bag. 16. Use the sewing machine to top stitch the bottom end of the webbing handle into place. 17. Turn the tube inside out. Layer the two fabric circles one on top of the other, pin them to the bottom of the bag, and use the sewing machine to sew them into place. I sewed this seam twice, once the the over lock stitch and a second time with a straight stitch for added stability. 18. Thread the cording though the drawstring channel in the top of the bag, thread both ends of the cord in the cord stop, and tie the ends of the cording together with a slipknot. 19, Turn the bag right side out, pop your folding chair into the carrying bag, and take off for fabulous fun! 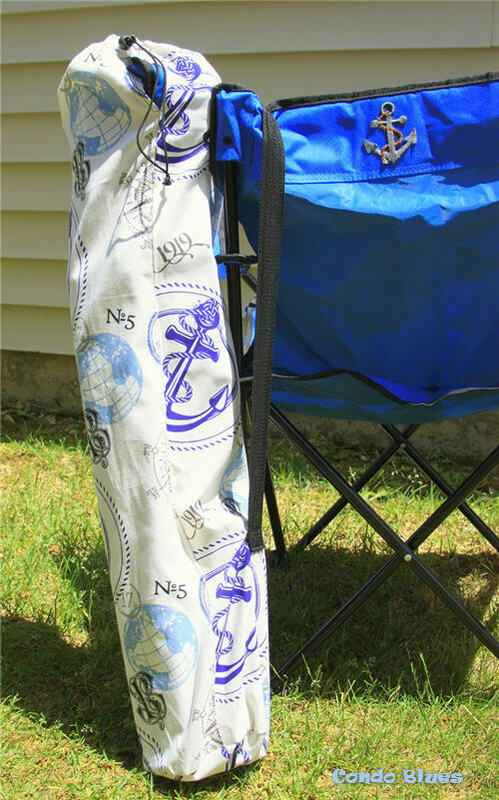 Learn how I machine I embroidered the camp chair in this post to match its new carrying bag!